We regard this version of Photon Sound Beam as not only the most effective, but also the most flexible instrument ever built. You are no longer limited to the program settings – we now have 2 sweep versions and many others programmed. We have now included a function where you can also use your computer to input custom frequencies. With our advanced delivery system through use of plasma applicators, and a radio frequency probe (aka RF Sound Probe), you are no longer limited to speakers (limited to 20 – 20000Hz) delivering Rife frequencies and others; our machine delivers frequencies well beyond and below the limitation of speakers. In fact your integration with your computer is only limited to the specifications of your computer’s sound card (many of them exceeding 300000Hz these days). In addition to this, our system features in built deep tissue penetration frequencies some which exceed 40000000 Hz. The Photon Sound Beam Complete system is cutting edge technology with design specifications exceeding the most advanced PSB systems available today. With our system, we have integration of Infra Red (IR) therapeutic technology becoming known in recent years to therapists, and we have also integrated a zapper more advanced than anything previously built. With the delivery system of plasma tubes and the RF probe (using carrier frequencies for deep tissue penetration), you get the delivery system more effective than any other zapper ever built. With Photon Sound Beam Complete, you get everything the title says – a powerful instrument which is Complete! Our High Frequency connectors used by the glass plasma tubes combine actual silver and gold wire together for the higher voltage transfer. This standard feature turns any regular glass plasma electrode into one that radiates the energetic vibrations of both gold and silver. Imagine, no need to obtain special electrodes. Improved carrier signals which allow penetration and delivery of applied frequencies into deep tissue areas, preventing the skin effect of other competing brands. A zapper function for viruses, bacteria and parasite elimination. 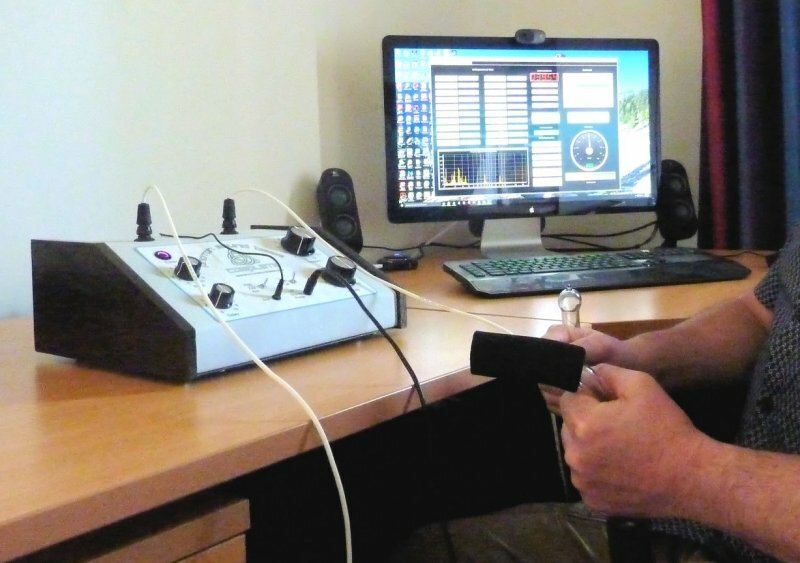 An Aux function for optional integration with Rife software for the perfect delivery system from the sound card output of your computer to the plasma tubes being held by your patient. Click here to read about the Photon Sound Beam function. 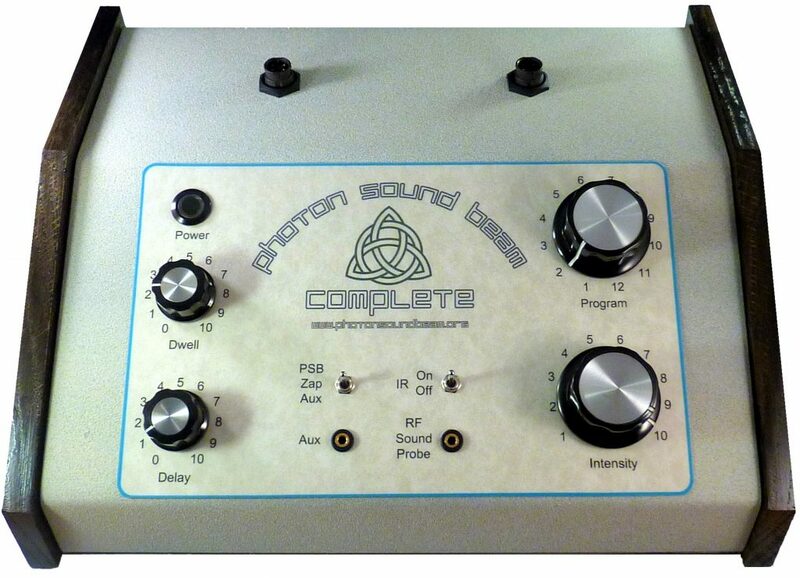 The Photon Sound Beam Complete comes with all cables required to run the various functions. The builders use only quality gold plated plugs and connectors to deliver 100% effective frequencies. The oscilloscope photos shown below indicate the quality and exact replication of the frequencies being delivered. 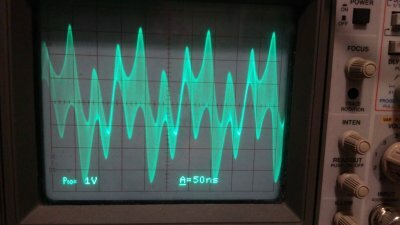 The waveforms are from the RFSP, as received from 2 different coil antennas connected to the scope’s probe. It’s less visible in the shorter ones, but the taller waves really display harmonics. There are 3 different peaks, representing the 3 frequencies, and the harmonics fill in as shading.